As some of you might know, for over half a year Birdy and I attended one of Germany’s most popular courses for parents and babies: PEKiP, i.e., the Prague-Parent-Child-Program. Parent – baby classes based on this concept are attended by an estimated 65 000 families in Germany, Austria, and Switzerland every week. It was fun to let Birdy get used to the company of other babies while I was enjoying the company of other moms. Most importantly, I loved the basic concept of this class: learning to observe your baby and to gently support her in figuring out the skills that she is trying to learn (If you want to know more about the class, check out my previous post about first experiences there). Here are the top five things that I learned in no particular order. Most interaction you can expect from two little ones is attempts to stick fingers into each other’s eyes or efforts to take away each other’s toys. Both of which, to my pride and (slight) embarrassment, my daughter is pretty good at. The so-called “crawling blankets” or “crawling mats” are great as long as the baby is relatively immobile, they provide a comfy surface to lay on or to practice rolling over. But they become completely useless as soon as the little one actually starts learning to crawl: they are simply too soft and do not stay in place. We noticed how much better Birdy was doing on the mats in baby class and bought her a yoga mat thus providing her with a non-slippery surface to practice on. You do not need to spend a small fortune on toys to make a baby happy (well, you can if that makes YOU happy). A cardboard box, a metal bowl, or a wood spoon will be just as fun for the little one. And, instead of buying new toys, you can always make them yourself: fill some bottles with materials such as sand and rocks, or peas and rice, put a few sealing clips in a plastic container with a lid, or tie colorful strings on a fly swatter and you have got yourself a toy that is guaranteed to keep the baby busy for a long time. Of course, be sensible: marbles (too small) or knives (too sharp) do NOT make suitable toys. We heard a lot of various advice at the baby class but one sentence in particular really hit home for me: you are the parent. You will likely receive well-intended advice from countless sources – relatives, doctors, teachers, friends, or even strangers on the street. But you are the parent and it is up to you to decide what you will do and how. After all you are the one who spends the most time with your baby, the one who knows her the best, the one who is responsible for her, and the one who has to live with any (good or bad) consequences that following that advice would entail. I took this advice to heart and blissfully ignored all baby class instructor’s suggestions about sleep training or introducing solids that I did not agree with! Read about our experience at a baby swimming class, including some valuable first time tips, in Swim Baby, Swim! Find out more about Hamburg’s “parent schools” in the post about a special kind of breakfast Parent Café: Coffee and Music Included. 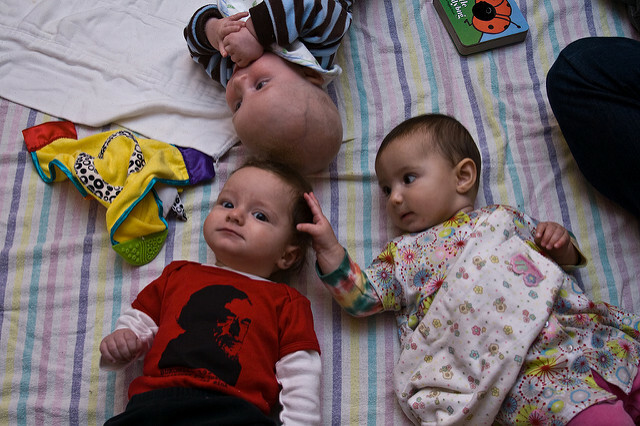 Learn about the German approach to starting daycare in the post Birdy Goes to Kindergarten.